Our 2013 fall silage harvest is officially complete! We chopped roughly 1970 tons of corn and sorghum silage over 66 calendar days, filling all three of our pits to capacity in the process. It was the best yield we've had in years, and it's good cow food according to the first forage test results we've received. It wasn't all easy, of course, and if you're a regular reader you know we've had mechanical, weather, and "we need to do extra herd work today" delays throughout. But it's done now...chopped, hauled, packed, covered, sealed, and ensiling. All that's really left to do is clean the silage chopper, take the side frames off of the dump truck, and watch our cows convert the silage into wholesome milk. We'll celebrate this accomplishment by having a full work schedule through the end of the week, tend to our regular milking/feeding chores over the weekend, and then start drilling next Spring's wheat and ryegrass crops into the ground come next week. we are now feeding our cows corn silage from the first pit we filled. We weren't able to get but five days of harvesting in the last couple of weeks, but we made pretty good progress the days we were in the field. We finished chopping all of the forage sorghum across the road from our dairy, with the final estimated yield on the BMR 108 Leafy variety working out to 14 tons per acre (72% moisture). And though we got stuck a few times, we did get most of the sorghum in our bottomland chopped. It didn't yield out as well, which is a result of simply too much moisture the first 6 weeks after planting. We still have 18 acres of sorghum growing on hill ground to harvest, and we'll plan on knocking it out on Monday and Tuesday. We'll go back to the creek bottom after that to chop what we can of the roughly 10 acres worth of sorghum (spread over 59 acres) that remains. By the end of harvest, we will be going into the winter with the most silage we've had in years...actually more than last summer's and this spring's crop combined. I will certainly be ready to celebrate the end of the long harvest season once we do finish, but that celebration won't last very long as we'll immediately start planting our spring grazing and silage crops. No rest for the weary, I guess, but such is life on a dairy farm! Chopping sorghum in the Yellow Creek Bottom. Looking out across a bottomland field. 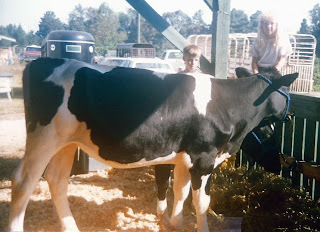 Growing up, I always looked forward to showing my family’s dairy cows during the “fair season” that ran from late summer through mid-autumn. Blue ribbons, clipping and grooming, friendships made in the barn that turned into rivalries once inside the show ring…all happy memories. The most vivid of these memories has has nothing to do with ribbons or showmanship, though, but is of a question I was asked at the 1990 West Alabama Fair in Tuscaloosa. Now I’ll admit, as an 11 year old kid I was really annoyed by this question. After all, how could a grown man NOT know that Dalmatians are dogs and that these were Holstein heifers? For a split-second I thought of giving a smarty-pants answer like, “Yeah, they love riding on fire trucks!,” but instead simply and dryly replied that they were actually Holsteins. My father and a few other dairymen within earshot responded differently. One immediately spit out a mouthful of boiled peanuts in a fit of laughter, while the others managed to at least muffle their laughter until the man had passed by. Looking back, I guess that was the moment that I realized not everyone knew about agriculture. It took me a few years to grasp the significance of that fact, and as an adult I have learned not to be surprised by some of the questions I’m asked. After all, most Americans have not had much (if any) direct experience with agriculture, and fewer and fewer students receive the benefit of agri-science classes in their schools. The responsibility falls upon those of us involved with agriculture to inform the rest of the public about our industry, and it is a responsibility we all need to take seriously and embrace. So to all of you non-farmers that might read this blog post, please don’t shy away from asking your questions. We "aggies" are are eager for the opportunity to share our knowledge with you…just please forgive us if we occasionally crack a smile or chuckle at some of your questions. Especially if you’re asking about Dalmatian cows. I pulled my son's air rifle out this past Saturday so he could get in session of backyard target practice. It had been a while since he had shot it, so I went through the whole safety spiel with him before letting him handle the gun. "Be safe," I said, "because it only takes once. One mistake, one careless moment, one shortcut with a gun could hurt or kill you or someone else." The same goes for farm equipment, and I should have taken my own advice earlier today. Though I generally use common sense and follow safety guidelines around the farm, I'm willing to admit that I've cut a corner now and then if doing the safe thing was really inconvenient. Like this morning, for instance. One of our tractors needed to go to the dealership's shop for repairs, and the hauler asked me to remove the GPS antenna off the roof before he left our farm. I should have gone looking for a ladder, but that would have taken too long. So I climbed up on the trailer, shimmied up the tractor's cab steps, grabbed the top of the roof, stepped onto the top of the rear tire, and swung around to the back where I could detach the unit while standing on the three-point hitch's lift arms. Mission accomplished, no problemo. Now I just had to get down. I started my descent by retracing my steps, but my route changed halfway through. The most awkward part of the process was getting from the tractor tire to the platform in front of the cab door. I got one foot there but lost my balance trying to get the other one over. Very luckily for me, I had enough time to realize what was happening and knew the best thing to do was push off and jump away. 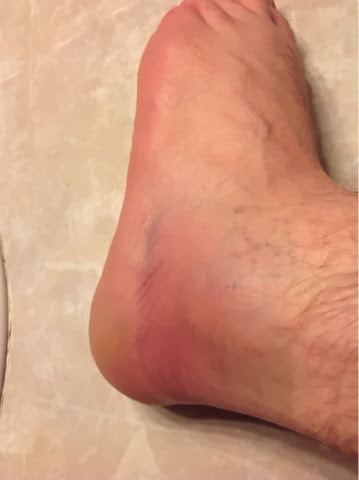 I landed hard but on my feet with nothing worse than a bruised foot from the 8-9 foot fall to show for it. It could have been much worse, as I likely would have fallen over backwards if I hadn't been able to push myself away from the tractor and trailer. Of course, it wouldn't have happened at all if I had taken two minutes to fetch a ladder. As I sat in the car on the way home from my son's soccer game tonight, all four of us singing along to "Louisiana Saturday Night" and having a grand time while my left foot throbbed, I decided life's too precious not to take a little extra time to be safe. As I said earlier, it only takes once. Hopefully once was enough to learn my lesson, because I might not be so lucky if there is a "next time".